Today a member of ChiNa-Cheats.com posted something about "KoolText Crack"! Stop posting any cracks from our friends or collegues websites & forums. all the board members... STOP CRAKING THE SOFTWARES that these people is living of, and they work hard to get what they deserve, a true hardwoking recognition! It means you are breaking the forum rules, and cracking our friends softwares and your breaking any other software rule! 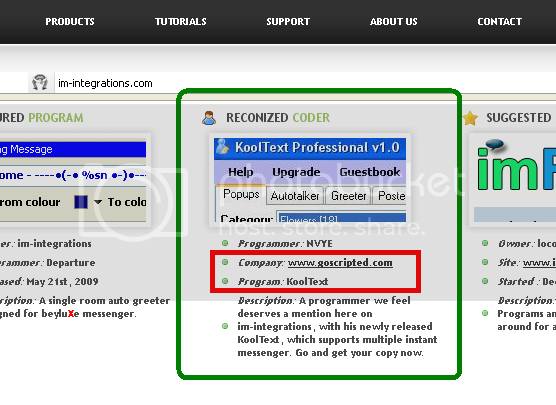 Below is the desciption for KoolText support site and etc. Did you know how much work it takes to build these softwares? Did you know that its illegal to post any cracks on dutchplace? Did you know where the KoolText is published from? The Word KooText on Im-Integrations.com means thats its a supported website!